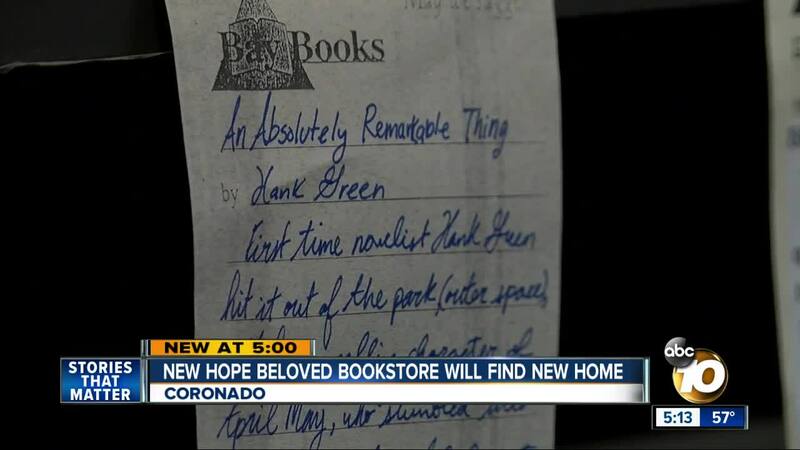 CORONADO, Calif. (KGTV) - Bay Books customers say there's something special about the store you can't find online, from handwritten book recommendations to the staff members who've been there longer than the books. “Most of them, we’re on a first name basis," said manager Barbara Chambers. The book store is going on 28 years and Chambers has been along for the journey since day one. “It just means everything to me; this is the best job I’ve ever had, living in the best town I ever have," said Chambers. But it's a job she thought might be coming to an end soon. Last year a developer bought nearly the whole Orange Avenue block of buildings, and the bookstore was only paying a fraction of market rent. With an uncertain future, they stopped purchasing new inventory. Now the bookstore is considering a new chapter down the block in a currently vacant building. Owner Angelica Muller says to make the business sustainable they'll also have to sell coffee and pastries, which she'll have to get city permission to do. While not official, it's a glimmer of hope for customers near and far. “I use to come here two to three times a month, I would sit in the back, read books and make a stack of books I wanted my mom to buy me!" said Coronado native Natalie Stringer. Stringer can't imagine Coronado without the beloved bookstore and hopes she won't have to.